Don’t strum all the way to the moment that the tough chord should be played and then changing chords (that’s like pressing pause while you’re playing, and even the tone-deaf know that ain’t right). When you’re headed straight for a tough chord, say Q#minor14 (see pic), only play on the first beat of the easy chord before it (G). 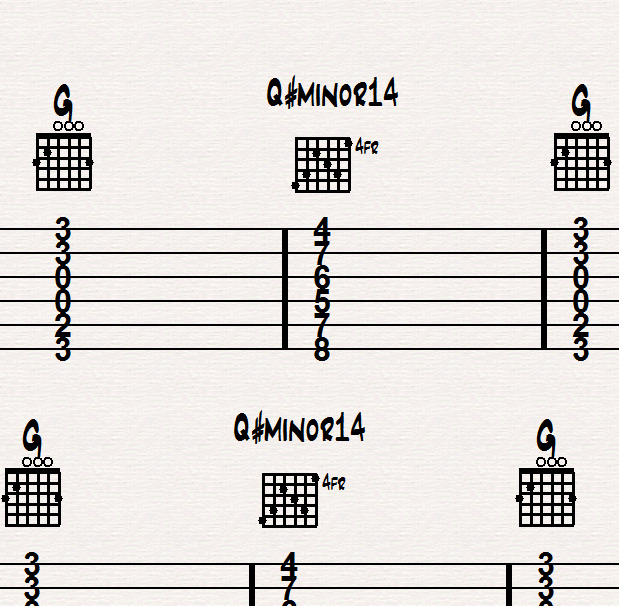 Use the next 3 beats to change to Q#minor14. 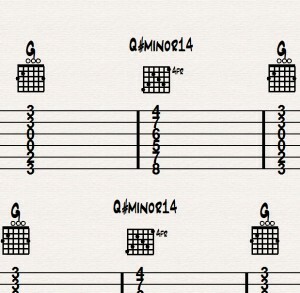 You’ll only hear G on the first beat beat, but if you keep the count going in your head while you change, you’ll play Q#minor14 right on time, keeping the song together. This is a lot better than the “Wait just a, I’ve almost..I’ve…” approach. Learning a tough chord change? Play the first and only the bass note of the second. Once that is working, playing the rest of the second will happen naturally.